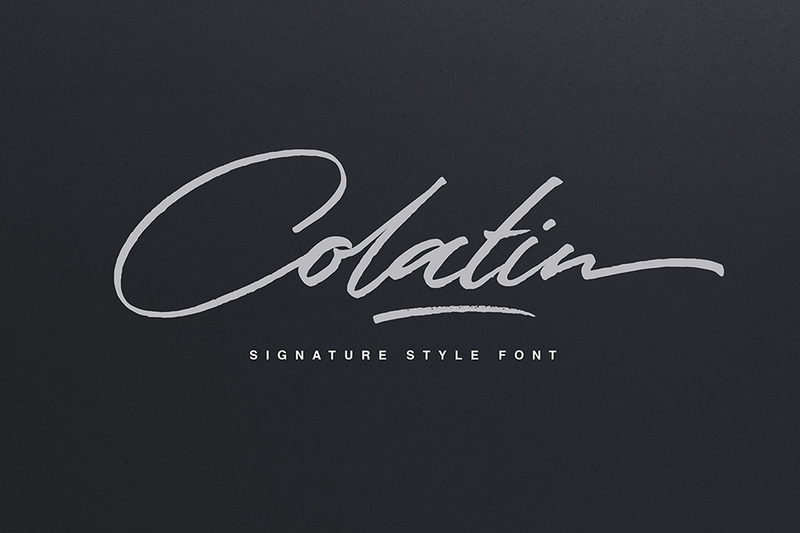 Colatin is handmade signature style font with stunning characters. Ideal for logos, name tags, handwritten quotes, product packaging, merchandise, social media & greeting cards. It contains a full set of lower & uppercase letters, a large range of punctuation, numerals, and multilingual support. The font also contains several ligatures and contextual alternates for lower case characters, accessible in the Adobe Illustrator Glyphs panel, or under Stylistic Alternates in the Adobe Photoshop OpenType menu. But if you don’t have any OpenType specific software, you can still use Collatin as is, with its standard lowercase and uppercase letters. File size is approx 1.3MB (2.6MB unzipped), offered as a single download. This font looks great for what I’m looking for but I need to make a test before do buy. Is there any possibility to make an online test just buy writing a name on it and check how it looks like? Thanks so much for your comment and I’m so sorry if you were hoping to be able to test this font our on the actual deal page. We currently do not have this function available, however this is a popular request and so is definitely something that we are looking into for a future update. In the meantime, I would be happy to provide you with a pdf of words or phrases of your choice written in Colatin so that you can see what these would look like. Alternatively, I would be more than happy for you to purchase the bundle, trial it out and see if it’s a good fit for you. Hopefully you do find it to be useful, however if you decide it’s not for you please do let me know within 30 days of your purchase and I will happily refund you in full :). I have just popped you over an email to see which option you would prefer so I hope this helps!